QuitsApps is an app for quitting groups of applications, either on the fly, or using a schedule. Using the application you can either use "quit flags" to mark a collection of applications for immediate termination, or create a schedule for quitting applications at different times. Subsequently you can relaunch the last set of terminated applications. The are two windows in QuitsApps, the elements of which are explained below. Also refer to the accompanying screenshots for more illustrative explanations. • "Applications" Table. Displays all running apps on your Mac, dynamically, automatically updated. Use the "Quit?" column of "quit flags" to specify which apps to quit with the "Quit Apps" button. • "Log" pane. The log window shows recent activity. • "Flag All" button. Select all quit flags. • "Unflag All" button. Deselect all quit flags. • "Flag Applications" button. 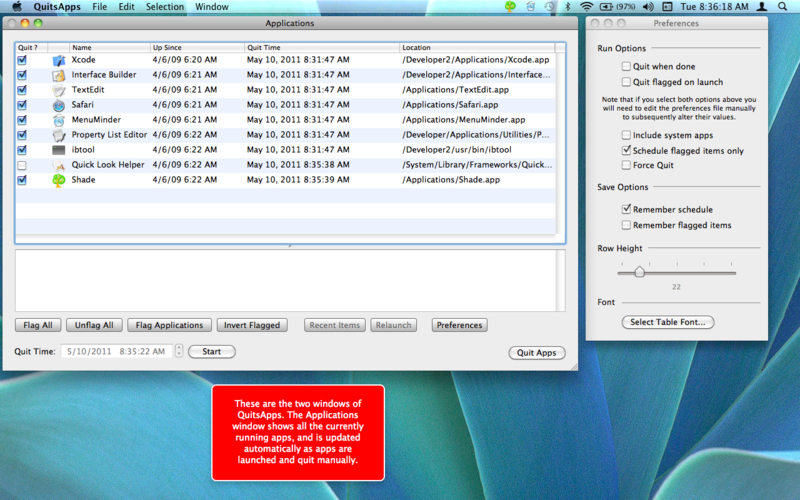 Select only those quit flags for applications in your "Applications" folder. • "Invert Flagged" button. Toggle the selected quit flags. • "Recent Items" button. Display the recently quit applications in the log pane. • "Relaunch" button. Relaunch the "recent items," i.e. the apps that were last quit. • "Preferences" button. Specify program options. • "Quit Time" date-time chooser. Select one or more rows in the table to schedule quit times, then click the "Start" button. If you only want the schedule to apply to flagged items, set this option in Preferences, "Schedule flagged items only." • "Quit Apps" button. Quit the flagged applications. • "Quit when done" checkbox. Quit QuitsApps after running. Note that if you select "Quit flagged on launch" also you will need to edit the preferences file manually to subsequently alter their values. • "Quit flagged on launch" checkbox. Quit the flagged applications when QuitsApps launches. Note: if you do not use "Remember flagged items" then all currently running apps will be quit on launch. • "Include system apps" checkbox. Also show applications that are not inside the "Applications" folder. • "Schedule flagged items only" checkbox. When running a scheduled quit operation, only quit flagged scheduled applications. • "Force quit" checkbox. Terminates an application without sending a “quit” event or allowing it any time to save user data or perform cleanup. This will avoid any dialogs appearing warning you of unsaved changes. • "Remember schedule" checkbox. Remember the scheduled quit time for each application when you quit QuitApps. • "Remember flagged items" checkbox. Remember which applications have been flagged for quitting when you quit QuitApps. • "Row Height" slider. Specify the height of the rows in the applications table. • "Select Table Font..." button. Choose a font for the table.